If I said I wasn't disappointed, I'd be a big fat liar. I mean, yea, of course I'm glad I didn't GAIN anything, but it's really frustrating that I had a really good week with exercise and eating and nothing happened. The number on the scale didn't change one little bit...not even a tenth of a pound. Ugh. 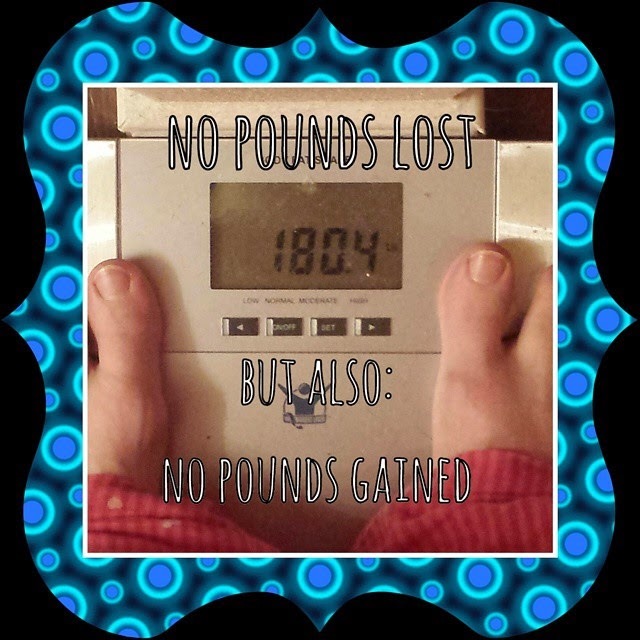 I was really hoping for 179.something when I stepped on the scale today. I'm just gonna try again and see if it moves next Saturday. • Saturday: I upped my game with my non-running workout. 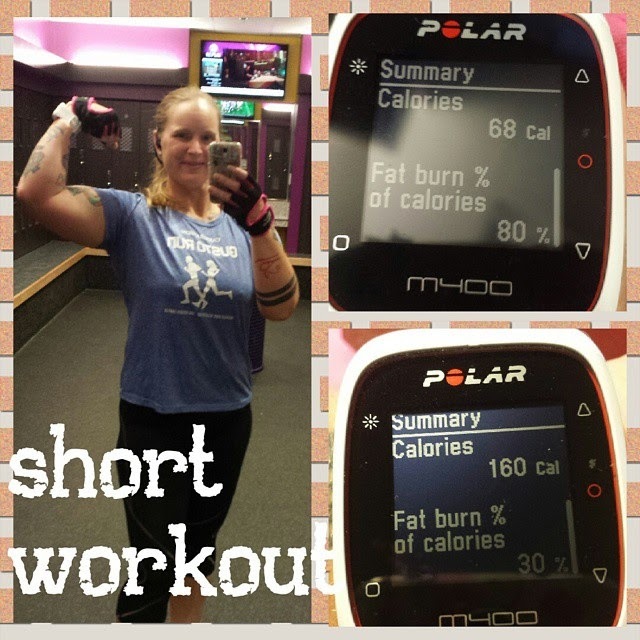 Previously, I was doing 2 circuits of the circuit training area machines at my PF…now I’m doing 3. Also, previously, I was doing the mid-length (45-ish minutes) Zumba classes on my Xbox Kinect…now I’m doing the full length (1 hour) classes. • Sunday: my last loooooooooooong run pre-Austin Marathon…22 miles. And let me tell you, I was very intimidated by this run. The last time I ran this route/distance, it was a horrible experience. I didn’t hydrate or fuel properly the day before and it was warmer than I was expecting it to be. I cramped and seized up so frequently that while it took me 4 hrs 38 minutes to do the running of the distance, I was out and about for over 6 hours because of all the stopping to stretch things out. This time, I only stopped twice that wasn’t at a stop light waiting for the walk light to cross the intersection…once was to say hello to a friend that I occasionally see out running (we used to work together a few years ago) and the other was a little after mile 20 to stretch a bit. Other than that, run run run. I did it in 4 hrs 12 minutes and it felt easy. The miles were just flying by. 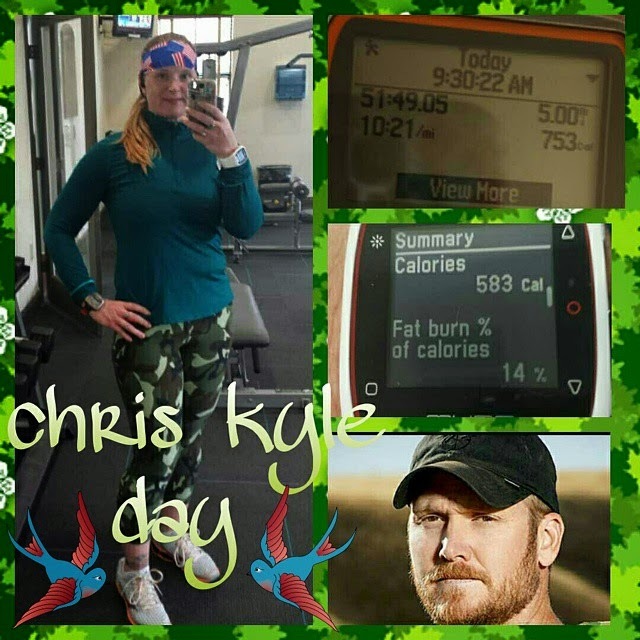 • Monday: Texas Governor Greg Abbott declared February 2nd to be Chris Kyle Day in Texas. This day marked the second anniversary of his killing. 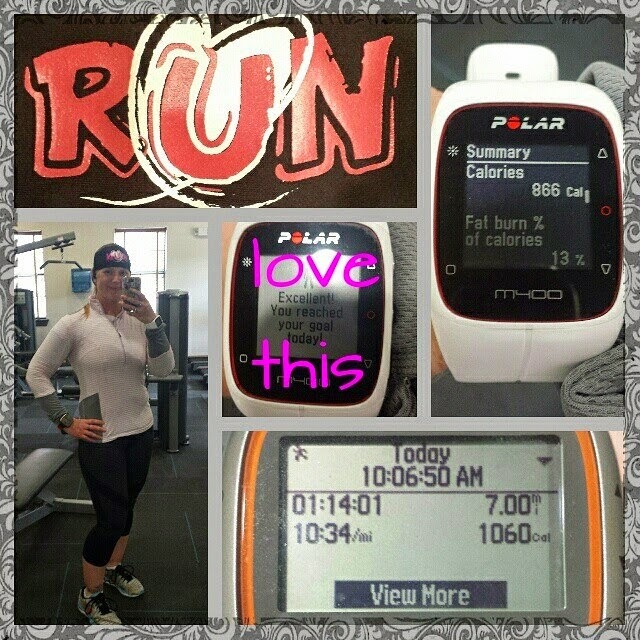 I ran my miles this day in his honor and memory. I thought of him the whole run and it was a great run. This was also my first run in my new Mizuno Prophecy 3’s. I know, the 4’s are out now, but I just got the 3’s. I got them in an end of season sale online for more than half off. I have to say, I love them. I feel like I could have run all day in them, that’s how comfortable they are. • Tuesday: decided to give my legs a little rest and hit the gym and some Zumba instead. I had a couple errands to run on top of working out, so I just did 2 rounds of the circuit training area and I did a short Zumba session. I was hoping that the short classes were 30 minutes. Nope. they were all 18-22 minutes. So, I picked one of the 22 minute ones. There was no warm up or cool down song, just 5 regular songs to Zumba to. • Wednesday: no workout. Got lucky and picked up an overtime shift! Super happy that even thought I didn't get in a workout that I still achieved 53% of my activity goal for the day when I spent the majority of the day sitting in a chair. I had meant to take my chest strap with me and go to the workout room at work and use the rowing machine, but I forgot the chest strap so I didn't do it. Wah wah. • Thursday: went to the gym AGAIN this day! WOOHOO! 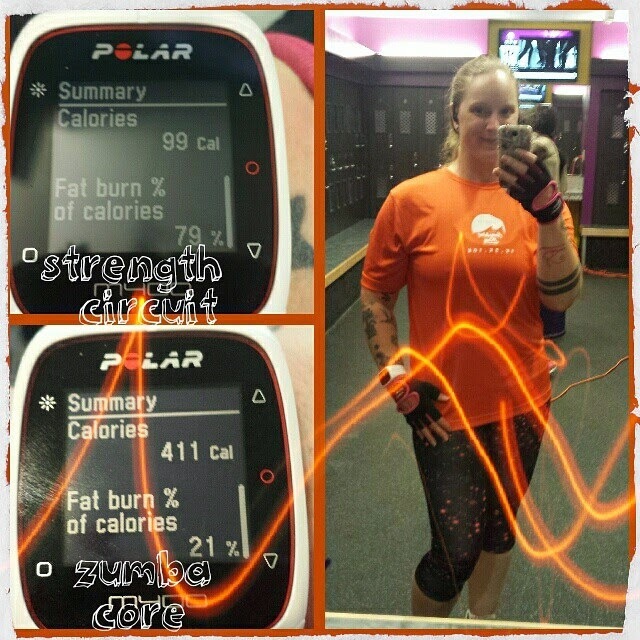 I had enough time to do 3 rounds of the circuit strength area and then went back home and did 45 minutes of Zumba. 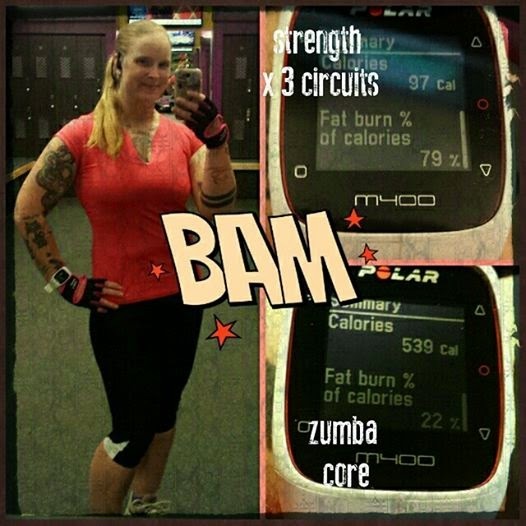 I was hoping to do my new full workout which would have been an hour of Zumba, but I didn’t have enough time. But, I am super happy with what I did get to do. • Friday: had a really good 7 mile run. 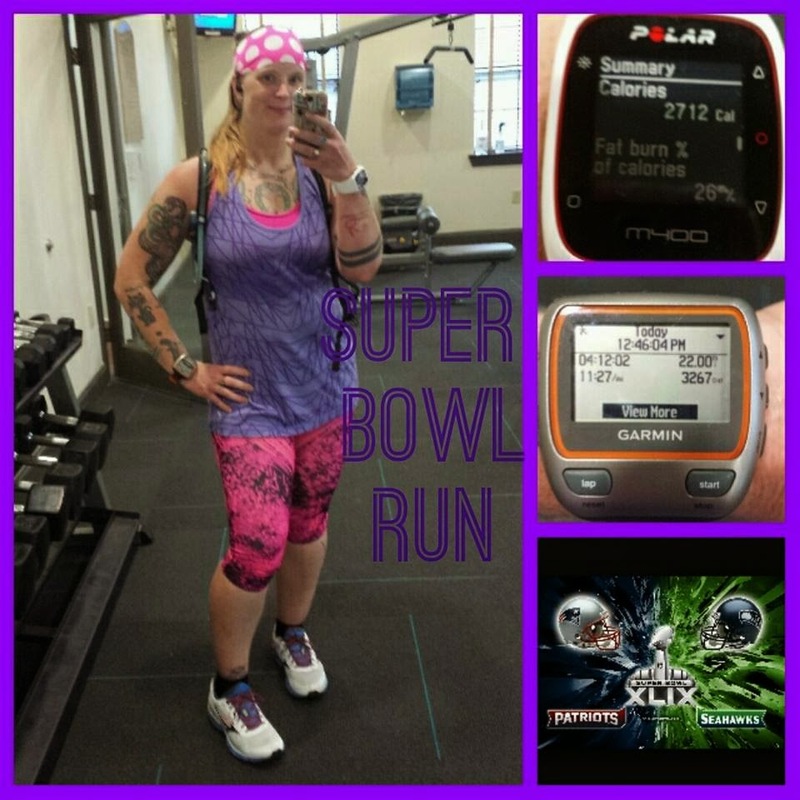 I had originally written up this week’s run schedule with a 3 mile and a 4 mile run, but because I really wanted to get a 3rd day at the gym and Zumba this week, I opted to just combine those 2 runs instead. I think it worked out just fine overall. I’m really happy I got that 3rd day in the gym and still got my scheduled mileage in for the week. 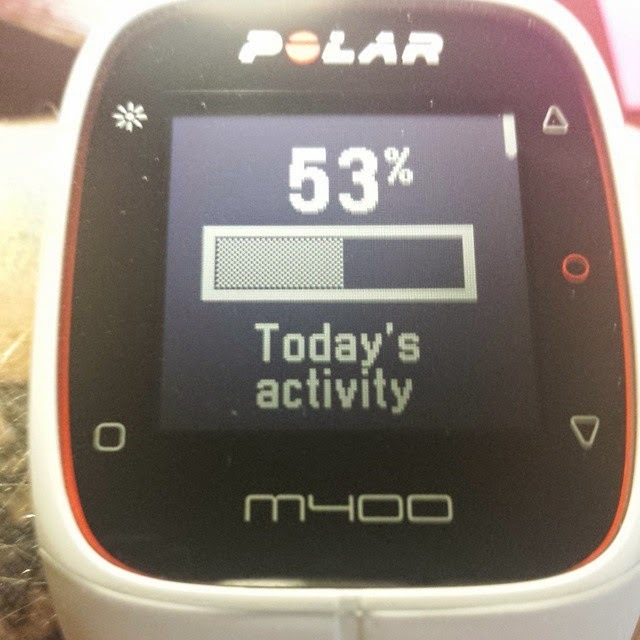 Also, I finally got a pic of what my Polar M400 displays when I’ve reached my activity goal for the day. It’s elusive. It only displays for like 5 seconds and then it resets to the clock display. But I was ready for it this time. Haha! As always, any time I workout, I am happy with it. I have more energy and just generally feel better about myself all day. And, plus, I am “allowed” to eat more on days I workout. Hahaha. Priorities. I hadn’t updated my weight with MyFitnessPal in a few weeks. Well, I did that last Saturday. When I did that, it prompted me to update my goals, so I did that. It wanted to change my daily calorie allowance from the 1900 I had it at down to 1460. Eeek! That’s a big drop. So, I compromised and went with 1700. It’s still less calories and I’ll re-evaluate it in a couple weeks. If I’m habitually 100 or more calories below my daily allowance, then I’ll drop it to 1600. But, for right now, I’m not comfortable doing an almost 500 calorie drop in my allowance just because it will make me lose weight faster. I’m okay with losing weight a little slower to make sure that I’m properly fueled. I am a runner first, a weight loser second. I discovered the most delicious hummus I’ve ever eaten this week. What is it? Hatch chile hummus!!! Hatch chiles are big in Texas and there is even a festival put on by the HEB/Central Market grocery chain every year. They add hatch chiles to everything from cheese to cookies to whatever you can think of! They hit the jackpot when they added it to hummus, let me tell you! I’m going back and buying a whole bunch of this hummus this weekend. Can you freeze hummus? I wonder. Earlier in the week, I had to stop at the grocery store to get some relish for my tuna salad sandwiches I ate this week and a salmon filet for dinner later in the week. When I got in the checkout lane, I was perusing the little cookbooks they have there and noticed a “skinny crockpot” recipe book. So, guess what I bought? Yep. And there are loads of recipes that I want to try! Also, speaking of plans for cooking, I will be making the zucchini taco boats again that I made this past Sunday…and the sweet potato samosa stuffed potato skins…yep, those too. However, I didn’t make them right, I just threw out the insides of the russet potatoes that I scooped out and the recipe says to whip those up and then add the sweet potato mixture and then you put it all in the potato skins.